Senate vote rebukes Trump on Syria, Afghanistan MARY CLARE JALONICK,Associated Press• January 31, 2019 Rand Paul: To call withdrawal from Syria and Afghanistan ‘precipitous’ is ludicrous after 17 years WASHINGTON (AP) — In a bipartisan rebuke to President Donald Trump, the Senate voted 68-23 Thursday to advance an amendment that would oppose withdrawal of U.S. troops from Syria and Afghanistan.The amendment by Senate Majority Leader Mitch McConnell comes after Trump called for a drawdown of troops in both of those countries. The measure says the Islamic State and al-Qaida militants still pose a serious threat to the United States, and it warns that „a precipitous withdrawal” of U.S. forces from those countries could „allow terrorists to regroup, destabilize critical regions and create vacuums that could be filled by Iran or Russia.”Trump abruptly tweeted plans for a U.S. pullout from Syria in December, arguing that the Islamic State had been defeated even though his intelligence chiefs have said the group remains a threat. Trump also ordered the military to develop plans to remove up to half of the 14,000 U.S. forces in Afghanistan.McConnell didn’t frame the measure as a reproach to the president, but he said before the vote that „I’ve been clear about my own views on these subjects.” He said he believes the threats remain.”ISIS and al-Qaida have yet to be defeated,” McConnell said. „And American national security interests require continued commitment to our missions there.”The vote is the latest indication of deepening cracks between the Republican Senate and Trump on foreign policy matters. Similar rifts exist within Trump’s own administration, evident this week when the heads of major U.S. intelligence agencies testified to the Senate and contradicted him on the strength of the Islamic State and several other foreign policy matters. Trump’s announcement on Syria, meanwhile, prompted the resignation of Defense Secretary James Mattis.McConnell’s amendment, which is nonbinding, would encourage cooperation between the White House and Congress to develop long-term strategies in both nations, „including a thorough accounting of the risks of withdrawing too hastily.”Sen. Marco Rubio, R-Fla., argued in support of the amendment on the Senate floor, saying Trump’s withdrawal announcement has already undermined U.S. credibility in the region.”This is being used against us right now,” Rubio said. „This is a very dangerous situation. That’s why this is a very bad idea.”Though many Democrats have argued that the U.S. should eventually withdraw from the conflicts in Syria and Afghanistan, around half of them supported McConnell’s resolution.California Sen. Dianne Feinstein said after the vote that she believes it’s „far past due for the United States to negotiate an appropriate end” to the conflict in Afghanistan. But she said she also agreed with McConnell that the „precipitous withdrawal” from either country without political resolutions would risk what troops there have already achieved. She voted in favor of the measure.Many of the most liberal members of the Senate — including several Democrats who are eying presidential runs in 2020 — voted against the amendment.Independent Sen. Bernie Sanders of Vermont said he thinks Trump announced the withdrawals too abruptly, but the U.S. has been in Afghanistan and Syria for too long. „What McConnell is saying is let’s maintain the status quo,” he said.A handful of Republicans also opposed the amendment. McConnell’s Kentucky colleague, Republican Sen. Rand Paul, missed the vote but said he was against it.”It’s time to bring our troops home from Afghanistan and Syria,” Paul wrote in a tweet, saying he stands with Trump. „It is ludicrous to call withdrawal after 17 years ‘precipitous. '”A vote on final passage of the amendment could come early next week. If it succeeds, the language would be added to a wide-ranging foreign policy bill that has been pending on the Senate floor for several weeks. The legislation includes measures supporting Israel and Jordan and slapping sanctions on Syrians involved in war crimes.That bill has also split centrist and liberal Democrats over a provision by Rubio that seeks to counter the global Boycott, Divest and Sanctions movement against Israel over its treatment of Palestinians and their settlements. Israel sees a growing threat from the BDS movement, which has led to increased boycotts of the Jewish state in support of the Palestinians.That has led to a „boycott of the boycotts” as Israel pushes back against those aligned with BDS.In support of Israel, Rubio’s measures would affirm the legal authority of state and local governments to restrict contracts and take other actions against those „engaged in BDS conduct.” Several states are facing lawsuits after taking action against workers supporting BDS boycotts of Israel.Opponents say Rubio’s measure infringes on free speech. A US intelligence chief has completely contradicted Donald Trump’s claims over the nuclear ambitions of both North Korea and Iran. Pyongyang is unlikely to give up its nuclear capabilities, while Tehran is currently not engaging in activities necessary to produce nuclear weapons, national intelligence director Dan Coats concluded in his annual “Worldwide Threat Assessment”. The findings of the report are in stark contrast to recent public statements made by the president on the situation in both countries. Presenting his conclusions to the Senate Intelligence Committee on Tuesday, Mr Coats said the US faced unique threats from each of the “big four” of China, Russia, Iran and North Korea, including cyber warfare and weapons of mass destruction (WMDs). He warned that although Pyongyang had not conducted a nuclear test in more than a year, it had little intention of decommissioning its weapons stockpiles. “We currently assess that North Korea will seek to retain its WMD capabilities and is unlikely to completely give up its nuclear weapons and production capabilities because its leaders ultimately view nuclear weapons as critical to regime survival,” Mr Coats said. The conclusions of the intelligence community appear to contradict Mr Trump’s assertions less than a month ago about how talks to denuclearise the Korean peninsula were progressing. “North Korea, we’re doing very well. And again, no rockets. There’s no rockets. There’s no anything. We’re doing very well,” he told reporters at the White House on 6 January. Meanwhile, despite warning Iran could look to test the limits of the Joint Comprehensive Plan of Action (JCPOA), Mr Coats said Tehran was not currently working on the production of nuclear weapons. “While we do not believe Iran currently is undertaking activities we judge necessary to produce a nuclear device, Iranian officials have publicly threatened to push the boundaries of JCPOA restrictions if Iran does not obtain the tangible financial benefits it expected from the deal,” he told the committee. But, addressing the United Nations Security Council in September, Mr Trump painted a very different picture. The president claimed he had pulled the US out of JCPOA, which seeks to limit Iran’s nuclear activities in return for relief from US, EU and UN sanctions, in May because Tehran was continuing with its atomic programme. “[Iran] must never be allowed to possess a nuclear weapon,” Mr Trump said: “For this reason I announced earlier this year that the United States would withdraw from the Iran nuclear deal. Mr Coats also dispelled the president’s widely-rejected claim Isis militants have been defeated in Syria, a claim made during the announcment of his shock decision to withdraw US troops from the country. “Remaining pockets of Isis and opposition fighters will continue, we assess, to stoke violence as we have seen in incidents happening in the Idlib province of Syria,” the intelligence director said. 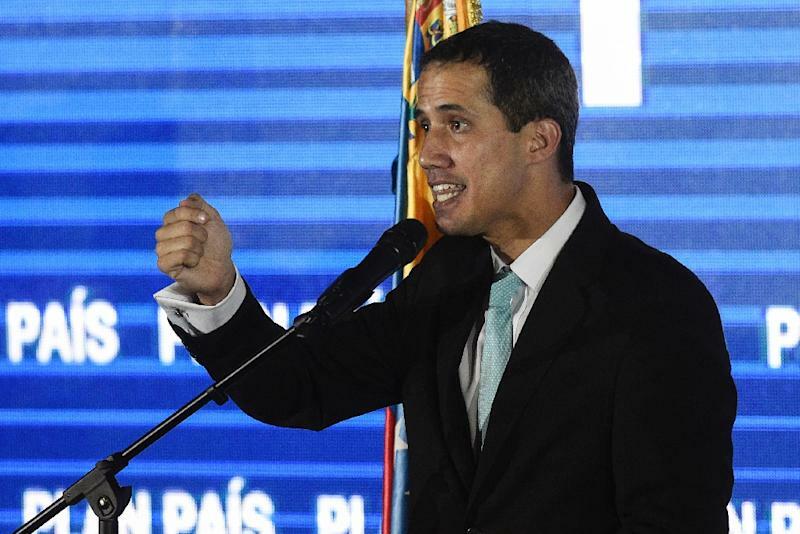 Washington (AFP) – The United States on Thursday called on European countries to move quickly to recognize Venezuela’s opposition leader Juan Guaido as interim president ahead of a deadline by major EU states. Kimberly Breier, the US assistant secretary of state in charge of Latin America, welcomed a vote Thursday to recognize Guaido by the European Parliament, although the move does not change EU policy. „We certainly encourage all the governments in Europe to support the people of Venezuela and the transitional government in Venezuela by recognizing Guaido as interim president,” Breier told European reporters in a telephone press briefing. She said that more than 20 countries had recognized Guaido, who last week declared himself acting president after Nicolas Maduro was inaugurated to a new term following elections widely seen as unfair. Besides the United States, major Western Hemisphere powers including Brazil, Canada and Argentina have followed suit. Four major European powers — Britain, France, Germany and Spain — have set a deadline of this weekend for Maduro to call new elections, failing which they will recognize Guaido. Maduro has said he is willing to negotiate with the opposition and even offered to bring forward legislative elections — but has dismissed the idea of a new presidential poll. The European position is not unanimous with Greece’s ruling leftist Syriza party pledging support for Maduro, who also enjoys the backing of Russia and China.